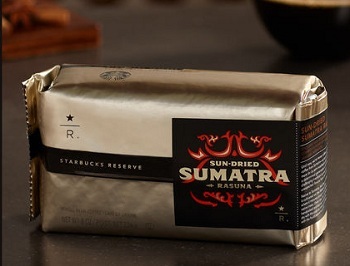 I recently gave some friends who weren’t too familiar with Sumatran coffees a little bit of a crash course in them by serving them some Sun Dried Sumatra Rasuna, one of Starbucks’ current Reserve coffees. This particular coffee is rather unusual because Sumatran coffees are typically semi-washed, not sun dried, during processing. Totally dry processing is uncommon in Indonesian coffees, due at least in part to high humidity, which doesn’t create ideal conditions for drying coffee. My friends either loved or really disliked (fortunately, most loved) the coffee, and I think that Sumatran coffees tend to be a little bit polarizing because they have very bold flavors. I, personally, really enjoy Sumatran coffees and think that this is a great example of one when it comes to its flavor profile. It is dark, rich and super earthy. I got some very juicy, sweet fruit towards the beginning and a very moist, tropical earth flavor throughout, with a nicely clean finish. This coffee was also good served cold, over ice (I did that with the Clover). As for the dry vs semi-dry processing method, I couldn’t say that one is better than the other based just on this one coffee, but would be interested in doing some side-by-side comparisons sometime to see how much of a difference I could detect.